Clayspray’s unique range of intelligent masque treatments use a blend of two elements: the purest clay in the world infused with natural spring water. 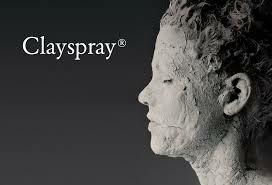 Clayspray products are exclusively sourced from sites historically renowned for their clay’s therapeutic properties. Within the Irene Mine, in the mountains of the Iberian Peninsula, is the Clayspray vein. Both red and white clay provide very important skincare benefits including antiseptic and exfoliating properties. They promote deep cleansing, removing environmental toxins and neutralise the toxic effect of free radicals. The array of masques are enhanced with naturally active ingredients such as Ginseng, Cacao and Aloe Vera, to boost skin’s well-being. Rich formula that combines the purifying red clay with the nourishing power of restorative cacao. Charged with extra minerals, vitamins and antioxidants to nourish your skin. Cacao aids cell regeneration and neutralises the damaging effect of free radicals giving skin a smooth and supple appearance, restoring the natural glow for healthy, and radiant looking skin. Suitable for all skin types. White clay and lavender treatment purifies the skin, stimulates blood circulation and relaxes the mind and body. Ideal for the hands and feet, apply before a manicure and pedicure to help soften cuticles. Relieves heavy tired legs, helps prevent ingrown hairs and is deodorising & absorbent. Suitable for all skin types. A pure blend of white clay and active ingredients targeted to improve sports recovery. Use before exercise to help increase elasticity and prevent injury, with its warming action. Use after exercise to relieve physical tensions and speed up muscle recovery. Contains menthol, methyl salicylate, devils claw & camphor. Warning: You may experience a sensation of heat of cold when using this treatment this is normal. All Clay Spray facials and body masks are £50. This includes the product to take home with you.